In 2014, we maintained a high level of service and quality to our student-athletes in the Capital Region. Our accomplishments include expanding our Blackboards and Backboards StudentAthlete Academy to serve 60 middle school student-athletes; The Capital District Classic fielded three games and was preceded by a banquet for the 20 participants in the “Elite Game”. By expanding our programs, we not only improved our community base, but more importantly provided more meaningful outlets for our youth.! Positive Impact New York, Inc is a place that allows student-athletes to reap the numerous benefits of participation in organized basketball events and aims to eliminate the negative influences and behaviors that frequently accompany youth basketball. At Positive Impact New York, we feel that the basketball court is a “classroom” in which we encourage our participants to develop and apply leadership skills by challenging them to demonstrate teamwork and dedication through competition. ! In 2014, we enhanced our program services and are continuing to identify new ways to inspire our Capital Region youth to become tomorrow’s leaders. To do this, we need your help. Whether it’s volunteering at our Blackboards & Backboards Student-Athlete Academy, or sponsoring our Capital District Classic, we will continue to scale Positive Impact New York with your support.! I wish you all much happiness, great health and success in 2015. I am fortunate to serve you and our youth!! UNDER ARMOUR! ELEVATE! SHOP RITE! SLAM MAGAZINE! Positive Impact New York, Inc. hosted its 4th annual Blackboards & Backboards StudentAthlete Academy at Brighter Choice Middle School for Boys.! Positive Impact New York, Inc. created “The Capital District Classic” to give Capital Region student-athletes a platform to showcase their talents. This year 40 of the area’s top middle school basketball players participated in this annual event that promises to be around for years to come.! The campers were treated to workshops on various topics such as NCAA guidelines, positive energy, goal setting, strength & conditioning, the recruiting process and speed and agility in addition to a rigorous basketball workout and games.! The purpose of the program is to encourage participation in sports, as a way of! encouraging and advancing excellence in academics. The camp offers a valuable opportunity designed to prepare players for competition and life at the next level with an emphasis on character, education, and skill development. Positive Impact New York hopes that “The Capital District Classic” will ignite the energy and passion of youth basketball in the Capital Region and bridge the gap between the Capital Region’s basketball legacy and the current youth basketball experience while providing an improved platform for competition and exposure.! Thanks to all who supported this year’s Capital District Classic. 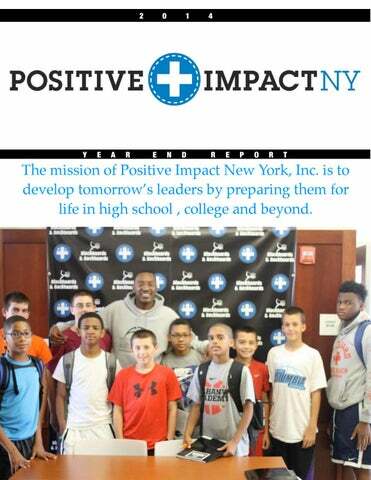 We at Positive Impact New York are committed to developing the total student-athlete. Wes Pluviose is the epitome of the total student-athlete. â&#x20AC;&#x153;Big Wesâ&#x20AC;? played his high school basketball at Albany High School in Albany, NY. After graduation, Wes made the decision to attend Xavier University in New Orleans where he is studying to be a surgeon. Wes is a great example of a young man who was focused and committed to his goals. His focus will turn into a college degree and successful life.